Whipped cream made from Coconut Cream is the best kept secret ever. This is ridiculously good and good for you, too. Although people from the tropics have enjoyed coconut cream forever, it’s about time the rest of us discovered this wonderful accompaniment for all kinds of dessert toppings. I hope you enjoy it. 1 14 to 16 oz. Coconut Cream, small tetra pak or canned Coconut Milk (make sure it is a full fat version with nothing else added) (I recommend Thai brand) or use homemade coconut cream from homemade coconut milk (See Notes below). Sweetener of choice to taste (optional – a drop or two or stevia, a small amount of raw white honey to keep the color white or coconut palm sugar, maple syrup etc. If you purchased the Coconut Cream (found at Asian Supermarkets in Tetra paks or frozen in a can) then there you have it. Coconut cream is naturally sweet and can be used as a whipped cream just as it is. Of course its not nearly as sweet as westernized whipped cream so feel free to sweeten it and flavor it to your liking. If you purchased canned coconut milk, be sure to place it in the refrigerator overnight. This will cause the cream to separate from the water and rise to the top. It naturally does this over time at room temp but the cold does this faster and causes a more distinct separation. Open the can and carefully scoop out just the top layer of cream a little at a time. Every can will vary on the amount of cream it has but generally it has about half of the can or less. Whip the coconut cream together with beaters or in a small blender. Add vanilla and any sweeteners you desire to use. If it's too runny, cover it and set in the refrigerator and it will stiffen up a bit after awhile due to the coconut oil in it that solidifies when cold. If you sweetened it with honey it will never get as stiff as it would without it. Important: Keep refrigerated and use within 2 days (possibly 3- but don't count on it) or it will spoil. 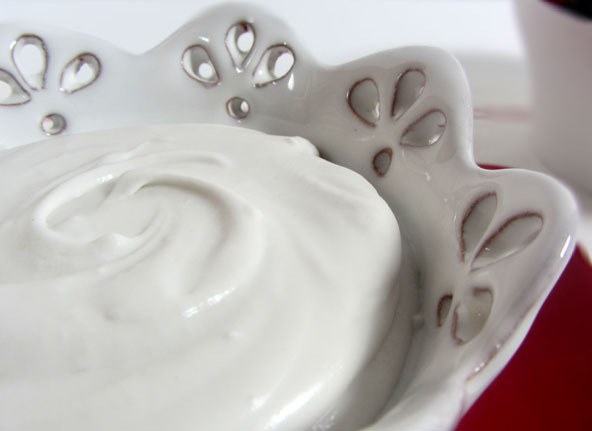 This makes a wonderful natural frosting or topping for just about any dessert. Remember that you are only going to get possibly ½ cup of cream from a can of coconut milk and sometimes even less so be sure to get enough cans to get the amount you desire. Buying pre-packaged coconut cream lets you know exactly how much you are getting and it is more cost effective. Coconut Products can get quite confusing especially when you find products called coconut creamed concentrate, creamed coconut and coconut cream. What the heck? See my article on Making Sense of Coconut Products. I personally hate the taste of canned coconut milk so I never in my wildest dreams thought I would like coconut cream other than making it fresh. But I discovered I was wrong. Thank goodness I forced myself to try it. I acted just like my kids trying something I already preconceived I wouldn't like due to past experiences with canned coconut milk. I discovered that it is the smelly separated water or whey left over when separated in the can that I don't like. Hooray, problem solved. I stay away from canned coconut milk. I buy coconut cream in tetra paks for whipped cream and frostings and I buy fresh frozen coconut milk (both found at Asian supermarkets) for making delicious ice cream or for many other recipes . See wRecipe for Healthy Chocolate Ice Cream.